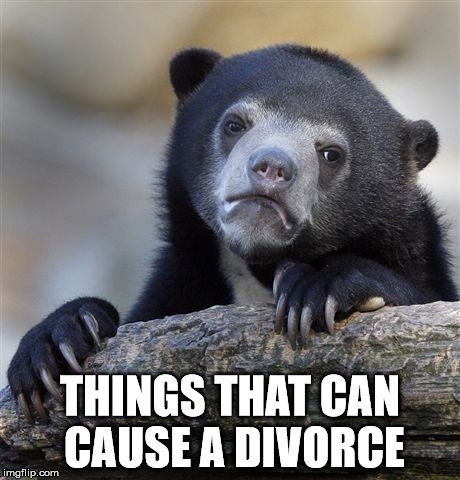 A serious list of reasons that cause many couples to divorce and what one can sometimes do to avert a divorce. Mainly it is simply self-awareness, early detection, and communication are all that is needed. In some cases, solutions are possible. One party too involved in their career or working too much. Emotional neglect. Different views on religion or politics. At the beginning of a marriage, both parties don’t think it’s a big deal. But over time, the disagreements become cumulative and can move to the forefront. Failure to communicate. One person or the other fails to tell the other of a concern that is on their mind. Instead they just let the “issue” build up. In time, the emotion becomes out of proportion to the actual concern. Failure to communicate. A misunderstanding develops that neither party realizes until it is too late. Lack of trust developing over time. Caused by the other items listed here. Money. Lack of money induces a never ending stress. Over time, blame issues may develop. Marrying someone who has habits you don’t like in the belief that you can change them. Failure to be open and honest. Though this includes lying, it also includes failure to volunteer important information. Marriages that begin for reasons other than love. This admittedly incomplete list was posted in the hopes it might help people. The simple awareness and communication about potential problems is sometimes all that is needed. The mutual awareness that external factors can cause stress. The mutual awareness of lack of communication. The mutual awareness of unintentional neglect. The key word is "mutual". These things and more can be overcome; if when something is first noticed, attention is immediately brought to it. Then it can be addressed and dealt with long before the stage where emotions override thought.